Soak Toordal,Channa dal,Raw rice,Cumin seed for 30 minutes. Grind soaked items with greenchilli and coconut as a fine paste. Heat oil in a pan and add chopped okras and shallow fry it well with salt. Take a bowl add one cup of water with yogurt and whisk well with salt. Heat the pan, add buttermilk in low heat, and add turmeric powder. Now add curry leaves,and ground paste to buttermilk. Its time to add cooked okras and salt to curry. Add water as required depending up on consistency desired. Cook it in low medium flame for almost 10 minutes until raw aroma leaves. Now add tadka(Mustard and red chilly) to mooru curry . Mooru curry is ready to serve. 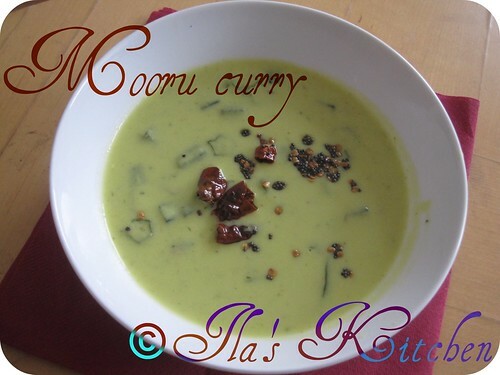 This yummy South Indian Recipe Mooru curry can be with steamy hot rice and dry veggie curry. yogurt curry is fav too!...love it with rice and pickle! Rice , mooru curry and pickle ..Bliss !!! 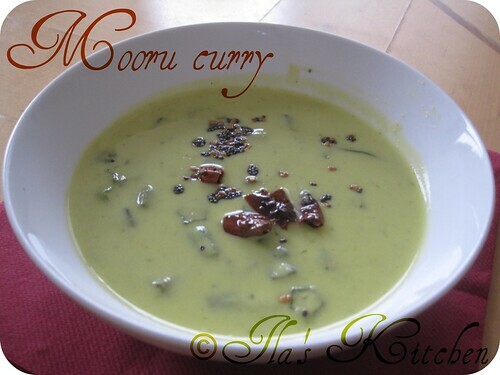 Delicious moru curry,perfect with rice. yummy more kozhambu... flavorful and looks delicious..
we didn't add any chanadal while making this curry. This one looks dleicious. wow...what a lovely recipe...though ne to me...but absolutely loved it ! This is my comfort food.Look delish. Lovely curry....looks so delicious dear. So creamy and yummy dish! Moru Kootan as we call it looks delicious..One of our family favorites..
superb moru curry...yum yum....love to have with rice..
Ah, the simple moru curry! This is a favorite with my family- a regular item at our table for lunch! Looks so tasty and adorable! Love this- simple- delicious n flavorful!